A response to the Borders bankruptcy, with a lengthy list of independent bookstore alternatives for the 200 closed Borders locations. On Wednesday morning, Borders announced that it would be filing for bankruptcy. As one of the first steps in bankruptcy proceedings, the nation’s second largest bookstore chain will be closing 200 of its stores and firing 6,000 of its 19,500 employees in the next few weeks. It’s also worth pointing out that Borders has stiffed publishers for hundreds of millions of dollars. A recent Publishers Weekly breakdown reveals that Penguin Group (USA) is owed $41.1 million, Hachette is owed $36.9 million, Simon & Schuster is owed $33.8 million, Random House is owed $33.5 million, and HarperCollins is owed $25.8 million. With thousands of jobs disappearing, hundreds of millions of dollars lost in bankruptcy limbo, and vital physical space possibly being taken up by other hands or converted into new retail areas that will have little to do with books, it would be a severe mistake to suggest that this won’t have a sizable impact on the book industry. On the other hand, now that the inevitable has occurred, the time has come to examine whether losing a Borders near you means losing the physical bookstore experience. Laura Kuechenmeister, who handles events and marketing for the Albuquerque indie Bookworks, suggested in a recent blog post that it has become necessary for independents to work together to promote book culture. If the Borders closings represent an opportunity for the indies, then the moment has arrived for indies to serve as optimal community bookstores. In the next few years, booksellers will need to transform their operations in which physical space and community matters and those vital connections with customers become more personal and long-term. And the vital question we have to ask now is what the present bookstore grid looks like. As you can see from the list below, in most cases, there is an independent bookstore within ten miles from a closed Borders. We should not discount the reality that some Borders closings will have a serious impact on communities, especially in rural areas within Colorado, Florida, and Ohio. Yet my investigations have also revealed that there are a great number of independent bookstores, often in unexpected areas. These independent bookstores are run not by faceless corporations, but passionate book lovers who very often read the books they stock. Their stock is, in most cases, almost exclusively physical books. With digital book sales only making up 8.32% of the total book market (according to the latest AAP Publishers Repot), reports of the end of print books are greatly exaggerated. In a USA Today article from last week, Fordham University marketing professor Albert Greco estimated that Borders has about 8.1% of the total book market. However, it’s worth pointing out that most of Borders’s 500 stores have opened up only in the last decade. How much of this 8.1% will move on to other physical bookstores? It is my hope that, in assembling this list, I have given that 8.1% share of the marketplace a very good reason to continue to support bookstores, especially those bookstores run by people who are interested in supporting the community. Methodology: The list of 200 Borders bookstores was obtained from court records. I located the alternative bookstores using a variety of online sources (Indiebound, Yelp, Citysearch) and attempted to include independent bookstores that were favorably reviewed by customers. Mileage was calculated by ZIP Code. As of February 18, 2011, I have confirmed that all of the following bookstores all remain open for business. I have also eliminated the two Puerto Rico bookstores that are closing. Like the Hawaii situation, if a Borders store closes on an island, chances are that you’ll have to go for a swim to find an alternative. I encourage the readers to leave comments if there are independent bookstores that I have overloooked or if the information is inaccurate. I will happily amend the list to account for any late-stage crowdsourcing. 2/20/11 UPDATE: Thanks to all who have spread the link around and offered additional alternatives in both the comments and on Twitter. I have amended the list to reflect this input. Please be advised that the criteria involves bookstores that are close to a closing Borders. So if I have missed your favorite independent bookstore, it is probably because there were other bookstores that were closer to the closed Borders in question. Nevertheless, I have added all received suggestions. Please feel free to continue with the comments and I will offer another update. 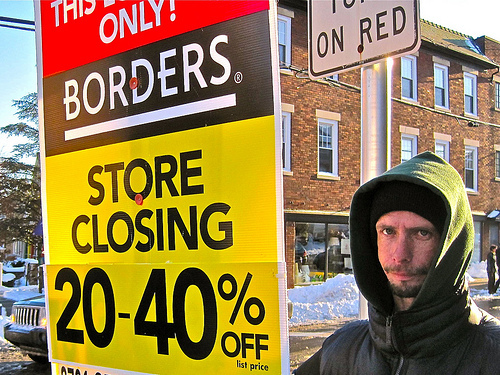 7/19/11 UPDATE: As of Monday, July 18, 2011, Borders could not find a buyer. It will be closing all of its stores. In the next few weeks, I will be preparing a revised list incorporating these new stores, along with the data we have generated from this list. Thanks to all for your continued input. Unknown aside from Kona Stories. Hawaii, being a group of islands, is particularly hard hit by the Borders closings. However, there are three Barnes & Nobles located in Hawaii — two in Honolulu, one in Maui.